The business of dieting is a multi-billion dollar industry. Its marketing is designed to make you feel bad about yourself, not good enough, and foster the belief that you must fit some narrow definition of beauty to be happy and successful. It is also true that many of you are dealing with a weight issue that is affecting your health and your lives. My approach is to support you in determining and reaching your healthy weight - the weight that is right for you and not a number determined by a chart or textbook - without promoting disordered thoughts and feelings around food or your body. Excess weight is a symptom, and your body's way of speaking to you. 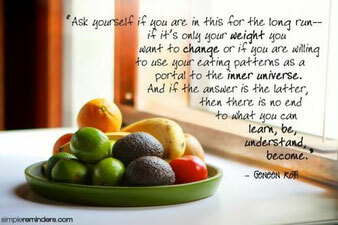 I help you to figure out what your body is asking for and support you in making those changes. Weight loss becomes a side effect of supporting and nourishing your body. If weight loss was simply calories in vs calories out North America would not have the obesity epidemic that currently exists. Other factors such as hormones, stress, toxicity, liver health, insulin, thyroid disorders, sensitivities, emotions, and more, can all affect one's ability to maintain a healthy weight. I take a personalized approach focusing on your unique needs and challenges which results in lasting change, and results! Located 10 minutes east of London in Dorchester, ON. Some appointments also available by Skype, Face Time, or Phone. Indigo Wellness Centre's services and opinions are not intended to treat, diagnose or cure disease.